We have published a prayer book to inspire and guide us in our daily works of love. It was written after people involved in serving their neighbours said a simple prayer book would be of great help. Staff and students from Oscott College, and others involved in our work, helped bring the book together. It contains prayers and meditations to inspire and guide people working to support those in great need. The book can be used at group meetings or by individuals undertaking visits and activities, particularly within the parish community. It aims to inspire and encourage them as they dedicate some of their time to loving and serving others in the way Christ commanded. Fr Michael White, Chair of the executive committee, said: “It’s not just individuals facing challenging situations who need divine help. Groups and communities do too. Anyone immersed in social action faces hard challenges all the time.” The prayers ask for guidance and strength to continue helping and serving others in the face of such challenges. 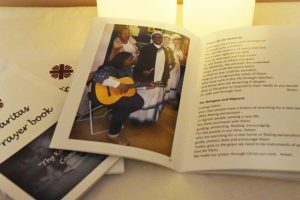 At just £2, the prayer book offers people involved in social action the chance for reflection and guidance as they go about their work. To request a copy, get in touch via the Contact us page on this website, call Bev Smith on 01675 434005 or email admin@caritas-aob.org.uk. Alternatively write to Caritas Prayer Book, c/o Father Hudson’s Care, St George’s House, Gerards Way, Coleshill B46 3FG.